Illusions of a Noetic Monk: The Middle Way - "Empty, Empty - Happy, Happy"
The Middle Way - "Empty, Empty - Happy, Happy"
To the surprise of most participants, and the dismay of some, this was not a silent meditation retreat. 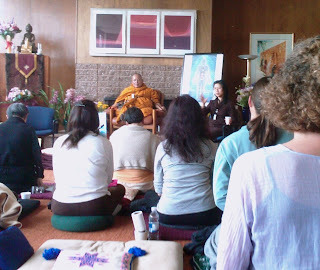 Instead, following breakfast and a morning meditation, each day was filled with Ajahn Jumnian explaining the principles of Buddhism and "The Middle Way" -- from about 9 AM to well-past midnight. His talks were in his native Thai and had to be interpreted. He focused a lot of time on a very detailed "Cycle of Dependent Origination" that generates the seeds of klesha (impurities of the mind such as greed, hatred and delusion that lead to unskillful acts). To be awakened, one must only cut the cycle at one point - a buddha must cut it at all points. "Have a clear understanding between knowing and experience. Minds tend to like and dislike. Be mindful of this -- stay unattached. Be skillful in seeing the mind's tendencies. Stay in knowing - without proliferating to more. The mind will have wisdom and purity -- abiding in the quality of the enlightened being." Buddha did not teach strict ascetic practices, as was common in his time, but was strict regarding maintaining the mind free of kilesa. "Even a small irritation with someone destroys well-being. Throw it away. Dwelling in the past is like driving backwards. We must stay in the present to guide ourselves on the middle path." "Let go of good and evil, love and hate - these are uncertain, impermanent, and have no substance -- cause more unhappiness than happiness. Stay on the middle road -- no need to sample everything along the way. Be more interested in things with more permanence such as emptiness and purity of mind. See the past as past - let it go. The stream of Nirvana is much more pleasant to abide in." "Nirvana is beyond form and formlessness. Falling into the stream of Nirvana is like no other experience -- no sankhara of any kind -- can't function. It's a little like blanking unconscious with awareness and mindfulness, but no form or memory." 1. personality view is abandoned - no further identification with the body - not self or belonging to self. 2. skeptical doubt / wavering is gone. 3. attachment to rites and rituals are known to not be liberating - true practice is in the mind. 4. no attachment to outside of self -- don't depend on or blame others. 5. defeats evil with good -- dirt is best washed with clean water. 6. anger, envy, jealousy, vengeance are lost -- never to return in this lifetime. A Stream Enterer still has 16 types of kilesa. "An Arhat (one who has realized Nirvana) sees light through the clear lens of emptiness to see things as they really are. Most people can't see through the sensual pleasures of the world. Nirvana is beyond the sense experience-- the senses create a barrier. Final Nirvana comes only with the death of the body. When a fully-enlightened person dies, he doesn't return." Jumnian is considered to be an expert in meditation, though I don't know how one rates such qualities. He suggests two methods (according to Ajahn Amaro, these were both taught by the Buddha). The first is Vipassana meditation -- focus on the breath. When the mind is still, switch gently to inquiry. The other is to stay focused on the breath down to the deepest levels of concentration (Samadhi). This will lead one into the Jhanas and to the Arupajhanas (disembodied awareness). The Jhanas and Arupajhanas are much more difficult to master, but it is there that one finds mystical and magical qualities and abilities that give one power over elements. In Jhana, one can visit the celestial realms, Brahma (formless) realms and hell realms. Though he told numerous stories of his meditation experiences into Jhana. Jumnian no longer teaches Jhana as he feels it is blissful, but not always useful. It must be used with wisdom. Its fruit deteriorate with time. The fruits of Vipassana do not deteriorate. Jhana is held in the 3rd chakra. A poster of this image, part of the "Sacred Mirrors" collection, captivated Ajahn Jumnian's attention. "I don't know who Alex Grey is, but he sees what I see during meditation," Jumnian said through an interpreter. He had never heard of the artist or seen his art before. Obviously intrigued with the work, he referred to the poster art numerous times during the retreat. Later, a book containing prints of the Sacred Mirrors collection was brought to him. "The pictures are real," he said. "They show the body in its refined form compared to its coarse form (anatomy)." 1. Worldly -- based in the 5 senses, sexuality -- inherrant restlessness, not stable, resides in the 2nd chakra. Conditioned -- dependant upon worldly conditions and sense pleasures. 2. Beyond the World -- Unconditioned -- not dependant on the 5 senses or worldly conditions. It is free from cravings. Time passes without concern for things outside the present. It's still not stable, but more stable than worldly. 3. Nirvana -- Spacious, formless, boundless -- no self. It's hard to maintain if defilements still exist. "Let go of suffering, sadness and painful mental states. Abide in the mood of well-being. Build beyond worldly happiness into transcendant happiness. Others will not easily percieve this in you. Noble ones experience the transcendant happiness beyond the world. It creates a condition for wisdom to arise at any momment." Jumnian taught that there is no need to strive for worldly gain -- it only causes pain and suffering. I told him that in the West we have a saying, "No pain, no gain." Without hesitation, he held out his hands as if to mimic a balance saying, through his interpretors, "Pain ... gain ... pain ... gain ..." while moving his hands up and down as if to indicate that pain and gain inversely balance one another. How much pain is the gain worth?